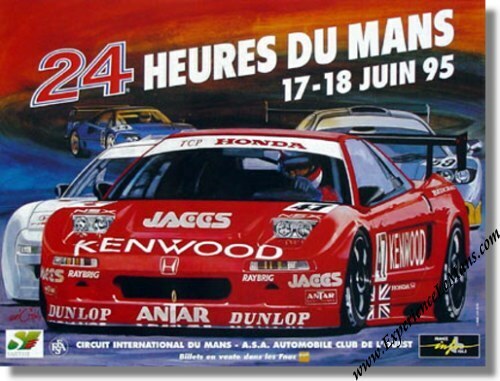 Original 1995 24 Hours of Le Mans Poster. June 17 & 18, 1995. The 1995 Le Mans poster is part of the "The star car used for sponsorship" era in Le Mans posters which lasted from 1981 to 1997. Design of the 1995 Le Mans poster was again in the hands of the S. Conseil agency and is, also again, based on a color illustration by Donnot. The GT category again topped the bill in 1995. It was the first time that a GT car would win the race outright. The illustrator's aspect proudly puts the cars of the foreground while the track itself has virtually vanished. The race was won by Yannick Dalmas, Masanori Sekiya and JJ Lehto in their # 59 McLaren F1 GTR - BMW with a total of 298 laps to their name. For the full results of this race, please see 24 Heures du Mans results 1995.